Yeah, sorry about that cycloid mess-up. I was so deep into it that I wasn't checking my math and time variables, got confused. I'll delete that shortly and replace it with the proper timing, etc.. I love that animated .GIF! Works great, thanks for doing that. I honestly just didn't feel like tossing it into Photoshop or whatever (kinda tedious, from Maya) and glad you beat me to it in this case. We turned a page, so I'll put it at the top. I believe that Steven said the ball in the curve "banks a few tens of degrees". I currently interpret that "fact" to mean that we can replace the circular track with large radius gently concave surface, like a shallow serving bowl. If we were accurate enough, a gently banked steel ribbon along a plate's rim would work just as well. Simply replacing the steel balls with patterned glass marbles would show that there weren't any additional rotations present; the experimental velocities may vary, but the outcome would remain the same. It's still fun. The ball in the curve banks a few tens of degrees because the circular path has the centripetal force next to gravity while the straight path has only gravity. I made some detailed video's of the banking to see if that could prove whether Miles formula a=v^2/2r or Newtons formula a=v^2/r is correct, but the difference between 20 degrees or 40 degrees was too hard to determine from a side view. Perhaps it can be determined more accurately with a half-circle setup. The banking was in the order of 20-40 degrees though, which was consistent with both formula's. Sometimes the banking was oscillating, guess that had to do with how the ball enters the circular path. The oscillation did not seem to affect the outcome. soostdijk wrote. The ball in the curve banks a few tens of degrees because the circular path has the centripetal force next to gravity while the straight path has only gravity. airman. I agree. I hadn’t worked with any centripetal force ‘analysis’, and so I avoided the subject, making the general observation to the effect that the additional track length due to banking was insignificant compared to the 20% distance increase of the curved motion metric. Steven, Welcome. Congratulations for demonstrating the new motion metric, pi=4. You’ve answered many comments, good and bad, again and again. I’m surprised that some people will not see the new metric, insisting (despite the evidence) that the ball is slower in the circular track. Could you share some thoughts on the reactions to your experiment? Your circular and straight tracks are elegant, sufficient and necessary to prove the motion metric. One complaint is the inability to monitor final velocities. After our site discussion above, I (Robert M) left a comment at the top of your short video comments section pointing out the obvious. The discussion occurred at the long video. You’ve mentioned track alternatives versus the seasonal lack of sunlight. Any updates there? soostdijk wrote. I made some detailed video's of the banking to see if that could prove whether Miles formula a=v^2/2r or Newtons formula a=v^2/r is correct, but the difference between 20 degrees or 40 degrees was too hard to determine from a side view. Perhaps it can be determined more accurately with a half-circle setup. The banking was in the order of 20-40 degrees though, which was consistent with both formula's. Sometimes the banking was oscillating, guess that had to do with how the ball enters the circular path. The oscillation did not seem to affect the outcome. I assumed a rolling contact. How can oscillations occur? Good, unexpected extra data. I became wrapped up in a 180 twist along the length of the 360deg pvc loop track – a spiraling tangent, but that has nothing to do with the motion metric. Given your breakthrough, I was delighted to post at TBolts as your proponent. I wasn’t good enough to carry off a winning angular momentum argument and so had mainly avoided that subject too. Nevertheless, I think the crowd there is ready for you. I'm convinced your work makes our future brighter. Thanks for the welcome and the kind words. Credit where credit is due, I got the idea through Miles from his description of Jeff's experiment with the toy trains. I did some experiments with electricity tube and metal balls to convince myself and was lucky to find the transparent PVC tubing so it could be shown in a clear video. I'm an engineer, like to make things work, happy to be able to help Miles here. LongtimeAirman wrote: You’ve answered many comments, good and bad, again and again. I’m surprised that some people will not see the new metric, insisting (despite the evidence) that the ball is slower in the circular track. Could you share some thoughts on the reactions to your experiment? Question: is the ball really slower? That is what most people cannot get their head around (including me ). You mention a new "metric", but that is a bit too mainstream for me. People have been confused into thinking that there are three orthogonal axes with an arbitrary origin spanning space, but distance and time are both derived from motion, so we first have to understand motion better. Think we have to start there by updating our understanding on momentum. The momentum of the ball seems to change instantly and is conserved around the circular motion. That is both curious. I have also done the experiment with the 180 degree circle setup and then the exit velocity of the circular ball is 3.14/4 of the entry velocity, so the "b" momentum as you call it is then lost. It is logical as the tube cannot deliver a pushing force, only a restrictive force, but as long as we cannot show without doubt what happens with the momentum of the ball at entry and exit I will not post it. Let people absorb this experiment first. LongtimeAirman wrote: Your circular and straight tracks are elegant, sufficient and necessary to prove the motion metric. One complaint is the inability to monitor final velocities. After our site discussion above, I (Robert M) left a comment at the top of your short video comments section pointing out the obvious. The discussion occurred at the long video. You’ve mentioned track alternatives versus the seasonal lack of sunlight. Any updates there? For the updates see above. About the oscillations, think they happen if the spin of the ball is not aligned closely with the curving of the tube so the ball overshoots. 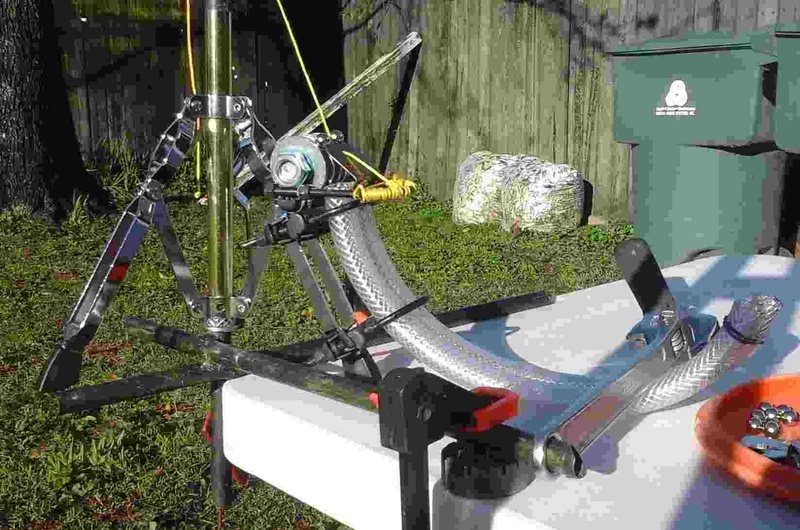 LongtimeAirman wrote: I became wrapped up in a 180 twist along the length of the 360deg pvc loop track – a spiraling tangent, but that has nothing to do with the motion metric. I waded through the insults on the TB forum to see if there is anything that I could clarify but I think it all has been done excellently by you already. 1. 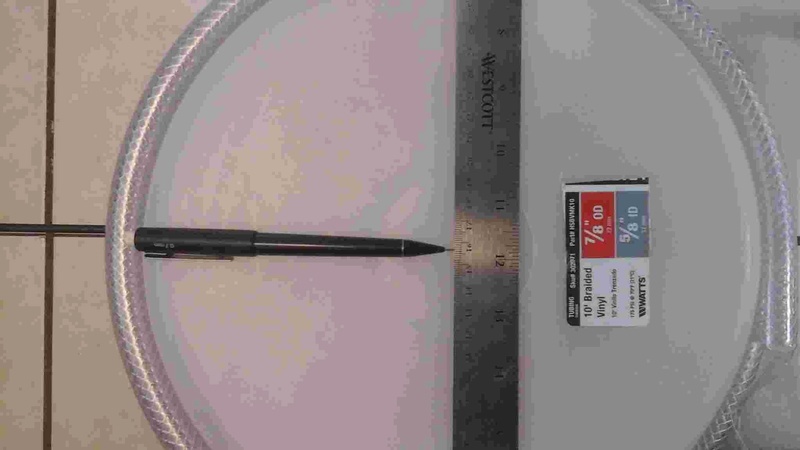 Pulling a "velocity" around a circle is not the same as pulling a solid ruler around a circle. The velocity vector will need to be rotated along the path otherwise it would not follow the path. This rotation takes time. So it would not be logical that the length of a circular path measured with a velocity would be the same as measured with a ruler. For all these people shouting that Pi will always remain 3.14, sure, but only for geometric ratios. 2. There was a discussion whether the definition of length would need to change but that is not the case. Measuring the length of the circular path starting with the origin on the path will yield 4 as is shown in the video. It would yield 3.14 measured from the virtual center but only if you ignore the rotating reference frame of the ball (which is interestingly enough actually admitted by the mainstream ). soostdijk wrote. I waded through the insults on the TB forum to see if there is anything that I could clarify but I think it all has been done excellently by you already. airman. Thanks for the positive review. Obviously I was learning during the discussion. Debating trolls with slowly improving arguments may not be ideal but it works. You’re right. I haven’t considered the “rotating reference frame of the ball” and how it’s necessary to properly calculate the motion distance. I will do so. I also need to spend a great deal more time examining the angular velocity aspect. How many degrees of banking differentiates Newton’s from Miles’ formulas? Of course, truth be told, we’ve had our own discussions here. Nevyn gave me the confidence to take on TB with the rate*time=distance argument; keeping it simple. I’m sure he’s ready for a rotating frame reference discussion. work, including the motion. See below. The rest of the update is an eye-opener too. By some quirk, my working diameter is 31.4cm. Steven O was careful to keep his ramp support structure outside his youtube video image. I can understand why, it's a distraction from the pi=4 demonstration. Hiding it only works once. I must improvise something - Oogly. A height adjustable ramp support structure. I haven’t cut the track lengths yet. 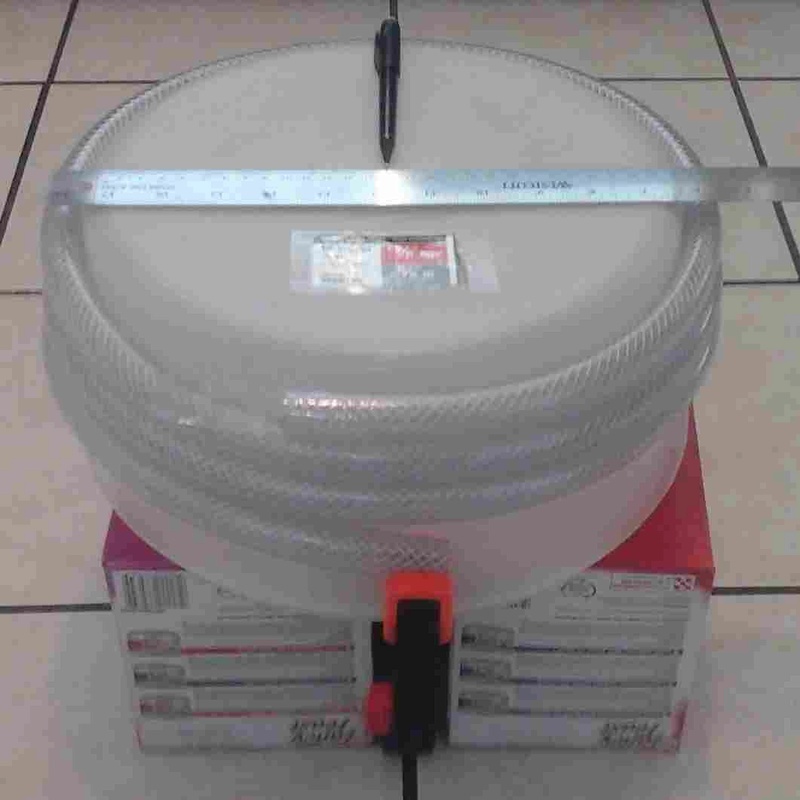 One can easily straighten coiled pvc using rope. Start with a feather (or steel ball), and thread. Or ask an electrician. 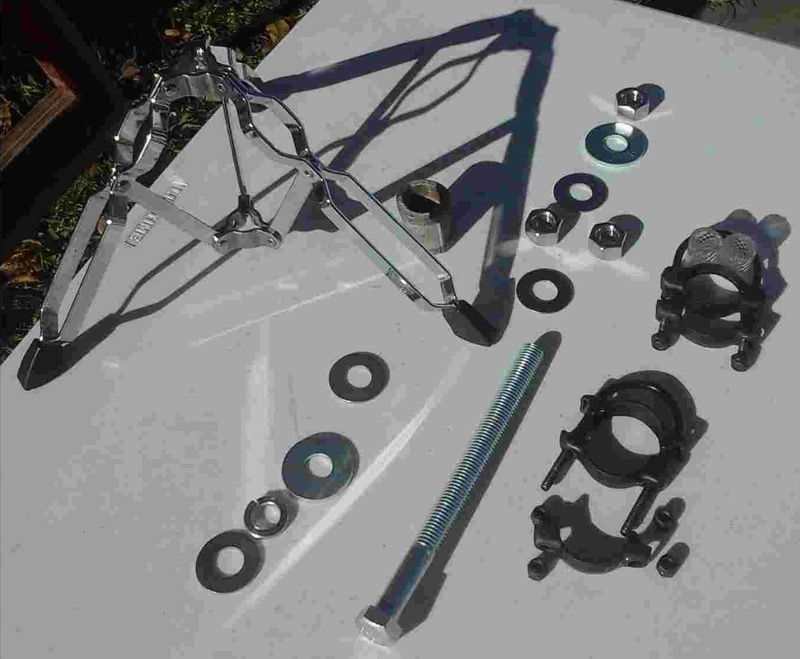 Thank you Serendipity, all but the steel 5/8X8in bolt, washers and nuts were in my junk box. Only the threaded U bolts’ half circle needs improving/modifying. 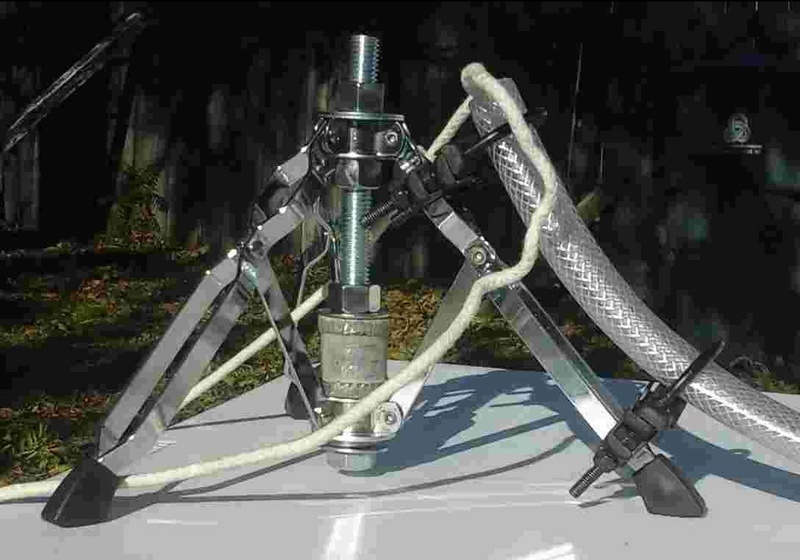 The U bolts clamps’ slightly concave/convex surfaces allow plenty of smooth controlled swivel about the tripod’s leg angle changes with little pvc pinching. 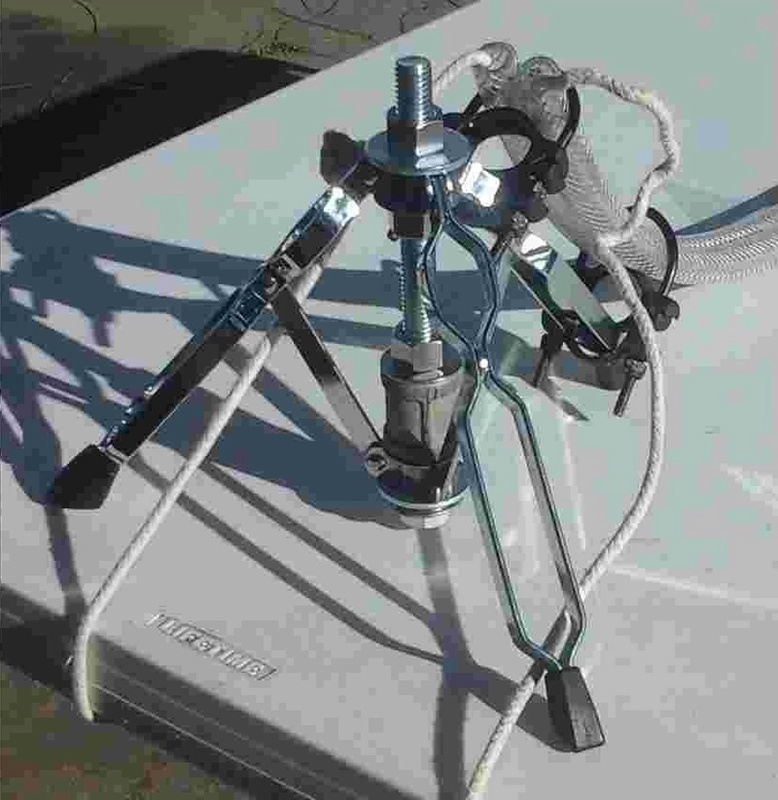 An old plumbing coupler is used here as a heavy spacer to get past the bolt’s shank. The release mechanism must be here somewhere. I'm grateful for the distraction. The following R code is submitted for your approval. HINT - Feedback is greatly appreciated. ## The pvc inside diameter is the trackWidthIn. 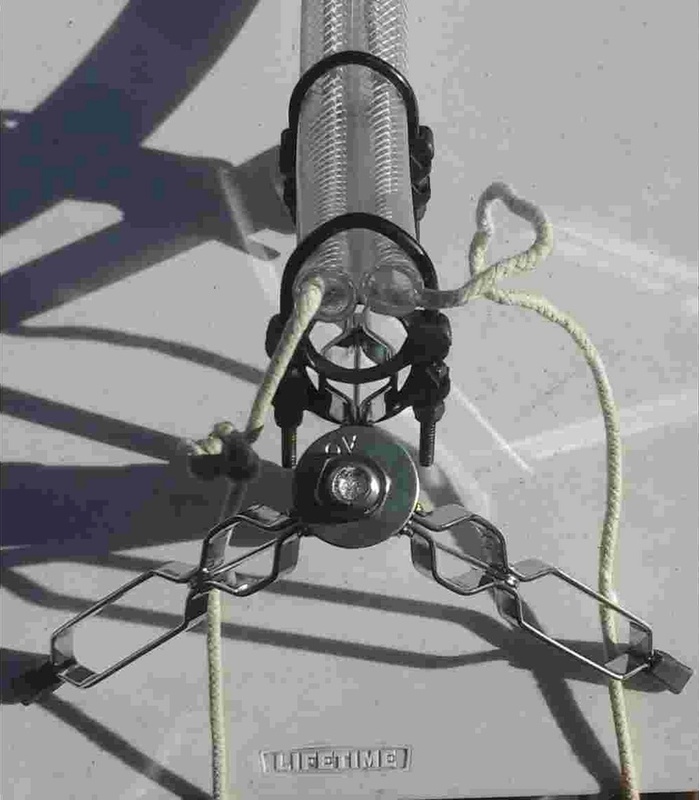 ## The pvc outside diameter is the trackWidthOut. ## and 3) straight track length (4*a_diameter). ## My workspace limit, table dimensions, is 29.5X71.25in. ## With a_diameter=31.4, d_straight = 188.4 > T2 = 180.975. ## I've exceeded my table length limit by a few centimeters. ## track to the table's diagonal. ## (initial and final) for the ggplot geom_path function. ## gain any more cm's. It's looking ugly for Oogly. Oh, and the table corners are rounded 6.35cm (2.5in). Looking really good LTAM. Nice craftsmanship. Excited to see the "pair" roll together down your set up! Maybe add some colored smoke down the tube at some point to see how it drifts out? Just a thought...sorry to add still another suggestion. I personally know how annoying extra-suggestions can sometimes be when you have completed a real piece of work and then someone stops by at the last minute and says -- "hey looks good but why don't you do this and that to it too?". The R script looks pretty top notch as well I might add. It is non-trivial IMHO at this point - but I'm just a hack myself. Cr6, Thanks. I should have been clearer. I'll admit to too much psychic stress over the last month. Mostly concerning our country's ongoing train wreck. This project is a positive relief. Craftsmanship? I prefer thrift shops and junk piles. Colored smoke? Oh my. I'm looking for suggestions on the R code. Criticism is better than compliments. Hack it. What would make you use it? Nevyn, I don't like coding trash. Please mark errors or make suggestions. Also, you indicated an opportunity to study R. Any insights or lessons learned? I'm good with constraints. Clearly, R is most suitable for large data groups, which is almost opposite from the Pi=4 setup, or any other Miles R project that comes to my mind. Another R package, ggvis, is supposed to make browser interaction possible. I'll look into it. Hey Airman, I can't offer too much advice specific to R because I didn't get that far into it but I can offer some suggestions about coding standards. As R is a language for mathematicians rather than programmers, you are going to find a lot of examples of bad coding style. I would even go so far as to say that the language itself promotes it. Make whitespace your friend. There are no prizes for doing the most in the smallest file size but you will thank yourself later for well formatted code. You have a few -1*a statements in there which should use the unary operator which is just -a. No need for an expensive multiplication just to make something negative. If you are using it in an expression you can use whitespace to specify exactly what you want, for example: 1--a won't work but 1 - -a will work. You could also do it once and assign it to a variable to save even more computations. This is using a function called 'c'. Not a good function name. What does it do? There is no way to tell that just from a single letter name. A function name should be descriptive which is why I have called R an ugly language in the past. Since I can't see the function definition in your code I assume it is being pulled in from a library or is a core R function so it may not be your fault but you could still make your own code more readable by assigning the function to a better name. Turns out 'c' is a core function that concatenates values into an array. See how if they had called it 'concat' it would be self-descriptive. Now, you might be thinking that it took more lines of code to do the same thing but it becomes so much easier to fix when you find an error in it and if you call it more than once then you have saved lines of code. It also makes is much easier to copy into another project. I hope that helps a little bit. Liberal use of whitespace, meaningful variable names and good function use go a long way to creating good, maintainable, re-usable code. ## CHANGE TABLE DIMENSIONS (T1 and T2) HERE My workspace limit, table dimensions, is 29.5X71.25in. ## final) for the ggplot geom_path function. ## cm's. It's looking ugly for Oogly. We’re looking down at two 7/16in steel ball bearings. Pull down that string on the left. It opens upward a cabinet hinge penetrated by the highest of three pipe clamp u-bolts in the assembly (I reamed the original screw holes open slightly to fit). 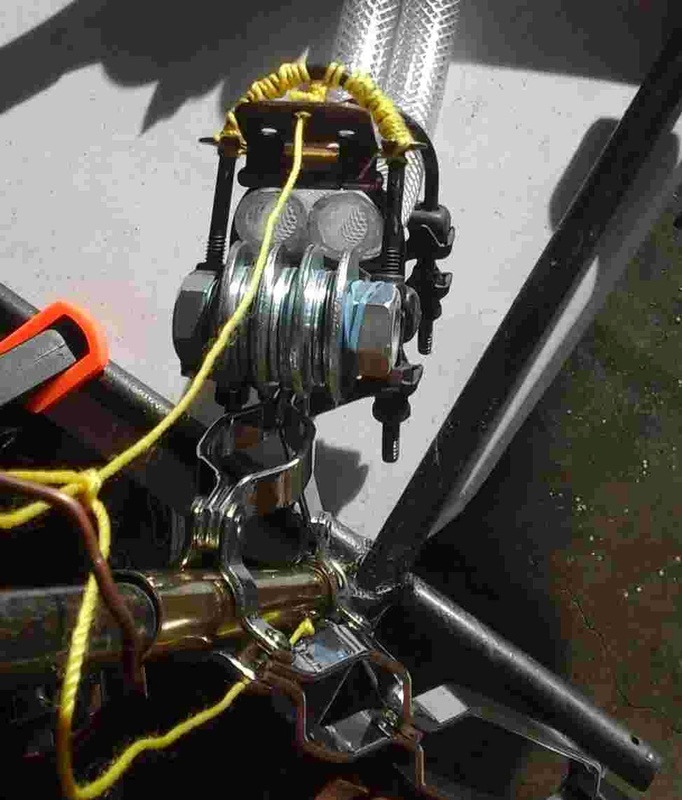 The string gives the hinge its ‘fixed’ bolt position as it also sits on the next u-bolt just below it. 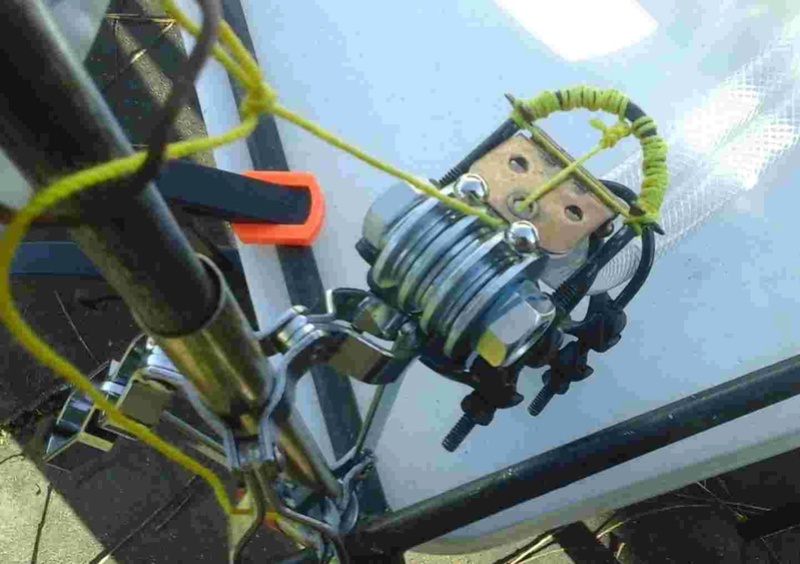 The top u-bolt is rubber banded to a full 5/8x2in bolt and half a clamp (not visible here). As you can see, the bolt holds 4 large and 9 smaller washers that make up the top of an initial raceway. Just below, the ramp openings are at 15cm above the table. Below you can see things are coming together, in some off center fashion. Speed trials are next. 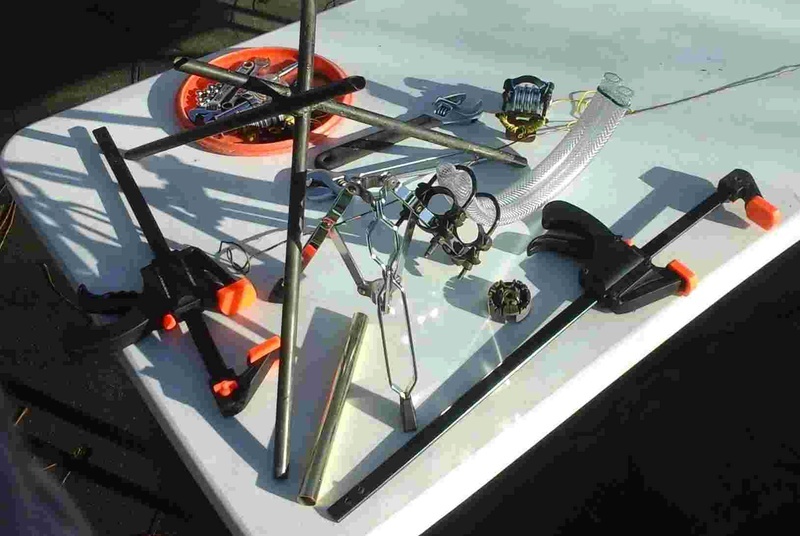 I’ll lay out two long straights and try to determine what my ramp’s vertical as well as horizontal components should be before I make any final track cuts. 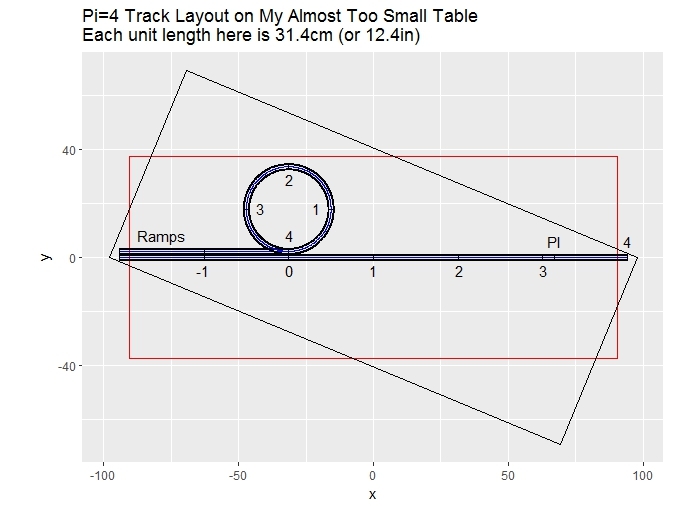 As I show with the R code plot, the complete layout for my diameter (31.4cm) should fit on the tabletop (please forgive the corner extension) with just a couple of centimeters to spare. We should note that the balls’ paths over the small washer raceway involves curved motion – about 40deg - before a brief freefall. The ramps also force the balls through a 90deg change in direction to get to the tabletop, more curved motion. I’m not at all sure I can calculate the velocity changes complicated as they are by the compound velocities of gravitational acceleration, though I believe Steven O suggested I try. I suspect he used straight inclined ramps with a small final angle change – about 15cm high, ok, but how long? Of course it doesn’t matter what causes the initial velocity since we are only interested in the motion through the marked tracks. Using the quick pair of tracks here (held down with the weight of two wrenches), the steel balls exiting the tubes travel upward to reach a peak suggesting, as we might expect, pi/4 the height of the ready position. Pi = 4 R Code Update. Thanks for helping. I’ve cleaned, white-spaced and added a variable list to the code. I don’t know how to program with the geom_path function yet, so that must wait. I see that I’ve made short and long variable names, or more, for the same object - the long names are mainly for the reader. The formatR product above is just plain awful; though how would I know? ## geom_path plot commands in order to reduce the plotting code. ## show "a_diameter" and "a" in inches. ## b_trackWidthIn is the pvc inside diameter. ## "bi" equals "b_trackWidthIn", to simplify the geom_path commands. ## "bo" equals "b_trackWidthOut", again, to simplify the geom_path commands. ## "c314" equals "c_circumference". Used in the geom_path commands. ## each quadrant of the circular track. ## 2)initNegOneToZero(a_diameter); and 3) track length (4*a_diameter). ## With a_diameter=31.4, straightEst = 188.4 > T2 = 180.975. ## = neg arcTan(37.465/90.4875). Angle is in radians. ## rotated table coordinates "TR". ## 1)Ramp; 2)NegOneToZero; 3)ZeroToOne; 4)OneToTwo; 5)TwoToThree: and 4)ThreeToFour. ## Track Centerlines are blue. ## Text annotations are added in their appropriate sections. Milestone update. My first complete track layout, marked with 31.4cm diameter units on both the table (taped surface) as well as the track tubes. The video - not ready for prime time - shows a 10cm out-of-synch difference reaching the 4 mark, with the circle track ball winning. I removed the table’s circular track drawing and marks before this photo because of the unmatched confusion with the actual track. My ramp is as long as my current setup allows, placing my tube ends 21cm above the table. As such the ramps are too snug, and both tracks as well, having pushed past their table marks overnight despite plenty of tape. I’ll shorten the ramps another cm or so. Here we see an actual working diameter - in the way. This circle track is too tear shaped to be acceptable – the tubes are most rigid at curvature ends. The zero and four marks cannot meet face-to-face, and so an accurate circle is physically impossible. Next time I’ll lose the container and let the circular track overlap (spiral in). I’ve been very cautious, gently working suspended tracks with ropes and rags to straighten and mark them. Any unnecessary changes in direction reduces rolling efficiency. 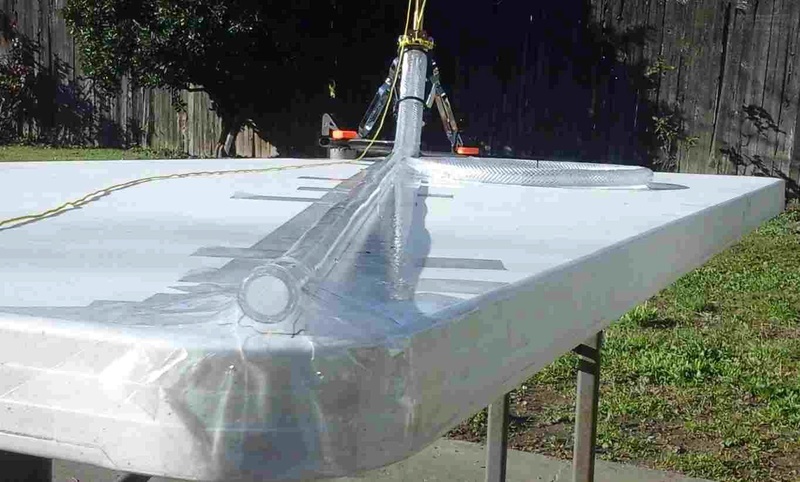 Taped (or fixed) track beside untaped positions can form areas of tension and compression resulting in unanticipated bends. Many unanticipated bends. I must improve my methodology. The circle is trying to lift off the table. 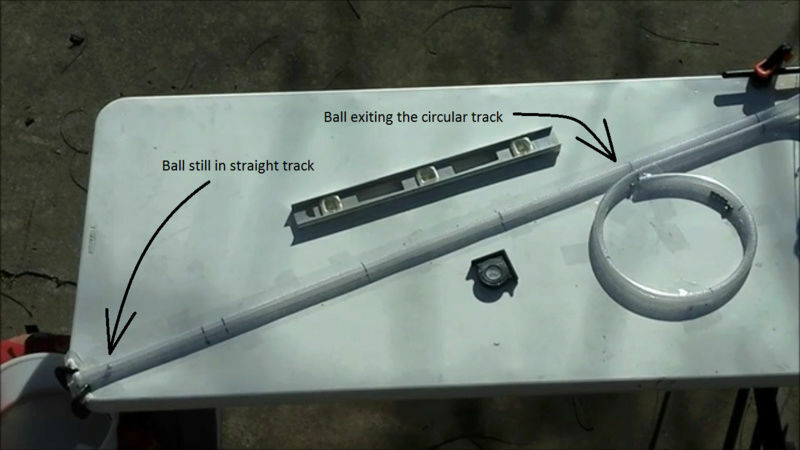 Here we can see the straight track 4 mark being pulled up off the table surface while the track tries to snake behind it. Switching to the more flexible, completely transparent pvc is easily done at this point. I was disappointed when I saw the transparent pvc deformed and even folded, over-packed onto spools at alternate local hardware stores, while the adjacent braided pvc tubes clearly kept their circular cross sections. The stronger braided pvc allow us to view the steel balls positions’, though at some loss in visibility. The braids can serve as surface coordinates - nice perpendicular and parallel guidelines. Plenty of practice, but no joy. My straight track is slightly slower than the circular. Both starting velocities are about 137 cm/s. 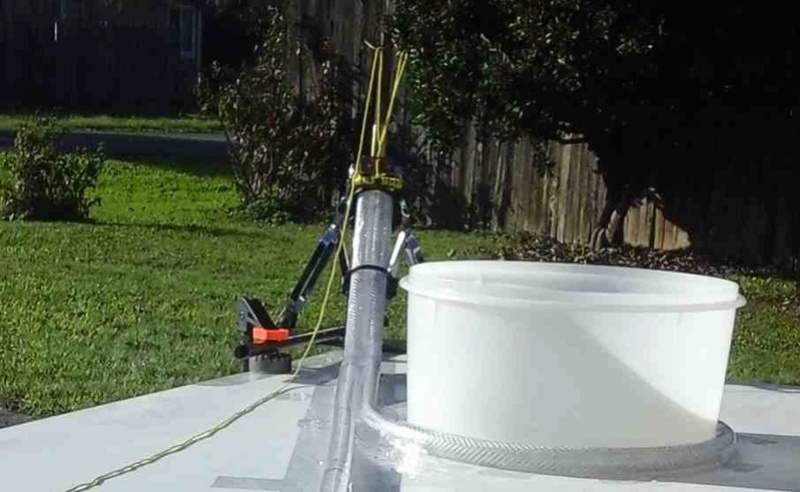 Using braided pvc, the ball bearings aren’t always visible even in daylight. I’ve also cut a set of clear pvc tracks which I’ve hung up to straighten before final marking and cuts. Are you sure it's a circular path? It seems slightly oval to me. Is there a way to check and correct it? Ciaolo wrote: Are you sure it's a circular path? It seems slightly oval to me. Is there a way to check and correct it? This circle track is too tear shaped to be acceptable – the tubes are most rigid at curvature ends. The zero and four marks cannot meet face-to-face, and so an accurate circle is physically impossible. Next time I’ll lose the container and let the circular track overlap (spiral in). In my latest image you can see a container, my working diameter, in the bottom left corner positioned to catch balls leaving the straight track. I actually use the container as working diameter/circumference to secure my circular track's 0,1, 2 and 3 marks to the table. I allow the circle's end, the four mark, to lift off the table, above the zero mark. I then remove the container and secure the 4 mark onto the table's surface as close to the zero mark as the track allows, thereby 'spiraling-in' to the 4 mark; the circular track is no longer a circle. You may have noticed that Steven's circular track is also slightly deformed. How does one correct for that? Curved motion works with spirals and ovals as well as with circles. I could make the entire circular track a spiral. I would plot the spiral image onto the tabletop and lay the track onto it, but then I wouldn't be able to use my 'working diameter' container. Actually I have an idea: use half a circumference instead of the whole one. This not only removes the problems in creating a perfect shape, but also allows you to measure the final speed. Ciaolo, I like your idea. I look forward to it. It'll just take me a while as I've committed myself to recreating Steven's demonstration first. I hope I'm not testing everyone's patience. Is the straight tube track pvc too corrugated or uneven which would then impact the ball enough to slow it down slightly? Basically, is it a non-flat rolling surface inside the pvc tube. Cr6, Correct. The problem is an uneven internal surface within the straight track caused by the coiling tendency. I've purchased pvc conduit in coils of under a foot diameter, 10 feet long. Pvc sold by the foot off of 100 foot coils is not as pretty in maintaining a circular cross section. The tracks must be straightened sufficiently so that they can be properly measured. The exception - braided pvc allows someone to cut accurate lengths without straightening by using the braids as a measure. Ok. Two tracks cut to length. One naturally lays the track beginning with the ramp, curved side downward - i.e. the track would coil in the vertical plane. With the circular track one might include a 90deg twist between the ramp and the track in order to ensure that the circular track's coil tendency would remain horizontal on the table surface. The circular track is therefore able to maintain a constant table pressure and cross section. Laying the straight track is the problem. After the ramp, it also wants to coil back into the vertical plane. As one secures points along the track, the linear areas between the secured points do not maintain a constant pressure with the table. The ball's path, the bottom of the pvc's internal cross section varies between too flat (and wide) and narrow (tall). The ball in the straight track thus has both vertical and horizontal changes that slow it down. The straight track should, eventually, lose its coil, but that may take weeks or months. It may be easier to lay the straight track such that the coil would remain in the horizontal plane. I believe I would also need a wall board alongside the straight path to secure it too and maintain a straight path direction. That’s the way it looks to me. The clear pvc is softer and may not spring back into the coil so easily. I should find out. You're a scientist. Testing things is what scientists do.